Vibrant, eclectic, and with a rich culture, Montevideo is all at once beachside luxury and cosmopolitan grunge. With art deco and neoclassical buildings in the historic downtown district, modern high-rises and posh beach communities in the southeast, and a vibrant theater and arts scene, Montevideo is like Uruguay's Copacabana. I was there for approx 19 months, good time there in carnival, outdoor, best for people who look forward for peace, green. quite expensive, but few places like Colonia, punta del este, cabo polonia are worth visiting. Whats a beautiful Place and interesting monument. If you stay around take this visit. This is the capital, a port city and the largest city in Uruguay. There is a laid back vibe with nice colonial architecture. We were there on a Sunday so the stores were not open but there is a very large street market that was very colorful. Watch out for pickpockets at the market! When I lived in Argentina and when I was just visiting I went here several times to renew me or my friend's visas. It really is that easy, and you can stay forever - as long as every three months you go to Uruguay (not super cheap but cheaper than fees). Montevideo was a blast, we stayed in a great little Hostel with a big red door, went out for drinks, I had a giant bowl of mozzarella (because being there a short time and before smart phones it was impossible to find anything vegetarian). Lots of cheap lager beers like Argentina as well, hard to find a good dark beer. We walked around the city all days, and down to the beach. My first time there, I don't know what was up but there were men with machine guns on every corner in the center and occasionally small groups of soldiers marching through plazas. We didn't ask, just gleefully pretended we had walked into a police state (though actually Argentina and Uruguay have an ugly, ugly police state history that's quite scary). Must go. 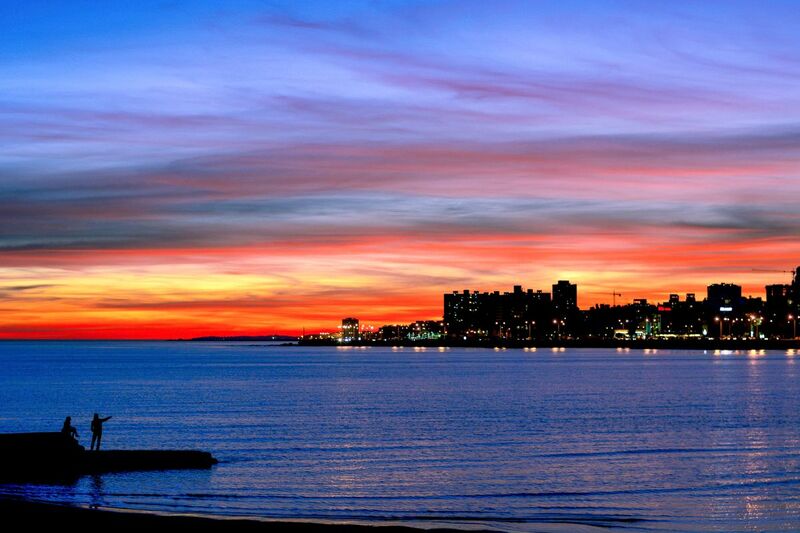 Montevideo, Uruguay was founded by Spanish explorers in 1726. The Spanish wanted a colony here to keep an eye on the Portugese in Brazil and Colonia del Sacremento. Montevideo serves as the commerical and political hub of Uruguay, a country of around three million people. Very beautiful city. Historical and all of the people were helpful and friendly. This is a different city. Seems to have stopped in time. A decadent beauty, quiet and peaceful. You can make good walking tours, and when tired, Get a taxi, because it is very cheap. Do not miss the Rambla, the public market, where it is sold Uruguayan barbecue and a tour in downtown. The dulce de leche and chocolate candies there are the very best. Best to visit in spring or fall, because summer is too hot and winter is cold. There is a wind current called Minuano, which brings the chill from the south pole. To me it was a friendlier and slower version of Buenos Aires. Good food and nice places to see are all around. Well worth the visit. Very hot in january! Great new airport, beautiful sunset. Got chased by homeless teen for taking a picture of his house/doorway. I was in the wrong.